iridologyonline.com/product/constitutional-flash-cards/ This Link Leaves IIPA. Many iridologists notice that the pupil is often mis-shaped. These variations are relative to the spine in particular. This chart offers an explanation of both ellipsoid and flattened pupil sectors. It also discusses the relevance of pupil size and signs on the pupil border. Concise and easy to use: Size: open A3 (11.7 x 16.5 inches) – folds to A4. (8.3 x 11.7 inches) All A3 charts have a beautiful protective glazed finish. iridologyonline.com/product-category/charts/ This Link Leaves IIPA. https://www.iridologyonline.com/product-page/integrated-iridology-bowel-reflex-chart This Link Leaves IIPA. Accurately determine each client’s unique iris constitution. This chart features superior graphics of twenty types with descriptions of what to look for: the three primary types, the six most common structural variations and eleven common diatheses. This is a wonderful reference for practitioners using Constitutional Iridology. A3 size. (11.7 x 16.5 inches) All A3 charts have a beautiful protective glazed finish. 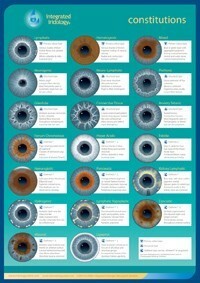 This attractive chart was revolutionary as the first chart to combine both American and European iridology philosophies. Fast becoming one of the world’s most popular charts for its accuracy and ease of use: Available in English and Spanish. Full colour, double sided with a protective glazed finish. Size: open A3 (11.7 x 16.5 inches) – folds to A4. (8.3 x 11.7 inches) All A3 charts have a beautiful protective glazed finish. Have you noticed that when you look at your eyes in the mirror, they are reversed? Use this chart to examine your own eyes in the mirror. This attractive chart was revolutionary as the first chart to combine both American and European iridology philosophies. Fast becoming one of the world’s most popular charts for its accuracy and ease of use: Available in English. Full colour, double sided with a protective glazed finish. Size: 18 X 13 cm (7 x 5 inches) – folds to 9 x 13 cm (3.5 X 5 inches). All A3 charts have a beautiful protective glazed finish. The white of the eye is called the sclera. It is a perfect adjunct to iris analysis in the assessment of health. The Integrated Iridology Sclera Chart explains forty common sclera signs based on the teachings of European masters and others who specialize in Sclerology. This attractive, easy to use chart includes a glossary on the back cover, making it an ideal desk reference. Size: open A3 (11.7 x 16.5 inches) – folds to A4. (8.3 x 11.7 inches) All A3 charts have a beautiful protective glazed finish.